1. Grown-up Shoes December 2013 Wallpaper - currently on my computer. Simple and pretty. 2. A Pair of Pears has a free printable for your mantle or bar cart. 3. Antiquaria is having a holiday card exchange. 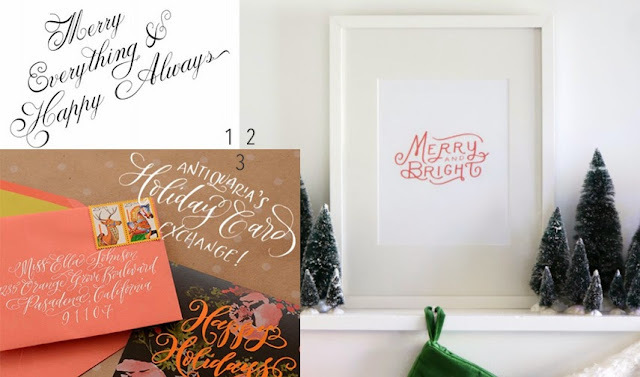 Simply add them to your holiday card mailing list, and they'll send you one of theirs - which are sure to be BEAUTIFUL - addressed by their calligrapher. I love love love their designs. And who wouldn't want to receive something so pretty in their mailbox? 4. Work on the above while listening to Darling Magazine's Monthly Music Mix: December Holiday. 5. So this one is really silly, and has nothing to do with entertaining (except maybe that epic Christmas party Kevin threw with zero living guests). Home Alone: Pug Puppy Version - too cute not to share. Holiday parties are officially beginning this weekend. I have my first to attend tomorrow - thank goodness for our lovely Megan's advice on holiday party attire! Next week I'm hosting (and sharing with you!) a little "Joyeux Noel" themed lunch, and we'll discuss holiday bar cart design. Looking forward to it!